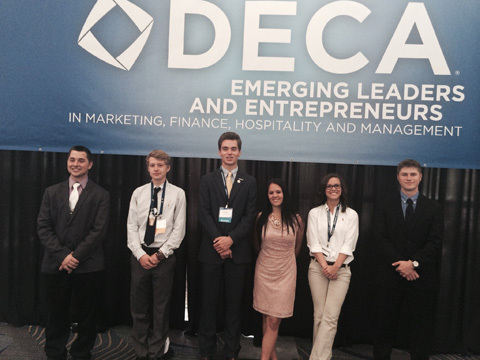 DECA is the co-curricular component of Marketing Education. It reinforces what is taught in the classroom with competitions, case studies and field experience. Badin DECA is proud to have had more state presidents than any other school in Ohio as well as having the first International President and Vice-President from a private school in the United States. Badin Marketing Education and DECA has a variety of activities and community service activities throughout the school year. An on-going service project is to collect money for Shared Harvest and the "Backpack program" Through individual marketing student donations we have a goal of collecting $100 per month. The money helps students have meals over the weekend. In October of this year we will have a BBQ Dinner to be held at Badin to raise money for Glenmary Home Missionaries. The Annual Spaghetti Dinner proceeds benefit the Paul Seal Scholarship Fund at Badin, which is awarded to two Badin DECA students each year. Paul Seal ‘69 was the first Badin DECA President and student to qualify for a DECA national competition. Paul was stricken with ALS and passed away in December 2013. This year to be held on Sunday, March 13, 2016. DECA Annual Mattress Sale - Saturday &AMP; Sunday March 12 &AMP; 13, 2016 in the Badin gym. Last year Badin Marketing students traveled to Joppa Mt, Tennessee to work at the Glenmary Mission. The students pay their own way to work in the missions. We will again participate in this worthwhile project. Badin DECA students sell Palm Crosses starting the month before Easter.